Hello, I am attempting to ID a sword from a single photo. 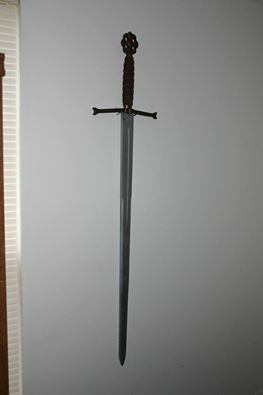 While I am familiar with types of swords, I am not so versed in the various eras and sword features than could identify one (or even narrow it down). Would you be able to help? More specifically, I am looking for search terms I could use to narrow down my purchase venture..... country of origin, name of the pommel design, possible years made, etc. I put a photo as an attachment. Thank you in advance. I think it is supposed to be similar to a historic sword, but I forget which one. Processional sword of the Catholic Monarchs, Ferdinand and Isabella... original is in the Real Armeria in Madrid. See, I knew I had come to the right place. Thank you for your assistance!